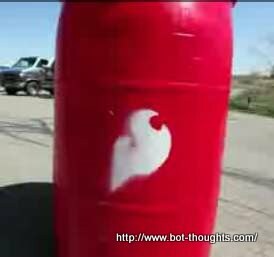 Bot Thoughts: AVC Bot: Barrels! Ok, so they are all bright, Sparkfun Red. One thing I did learn from Pokey is that vision sensors work really well in certain circumstances. This is one of them. I have a line on a color camera sensor with blob tracking. I'd love to roll my own but no can do in only 8 days with all the other problems I have to resolve. I'll continue the "systems integration" strategy with my robot. Hey, found your blog when searching for data to interface with the gameboy camera, you have a bunch of good information here. Good luck in the Sparkfun AVC. If I had a better budget and means of transportation I'd head to the event but Wisconsin is just a bit far away :) . I think it's cool to add detection of barrels and avoid them. But why not just adjust your path to go around them? Adjusting the path is a good idea and I am still considering it. But the main reason to do vision versus path adjustment is that navigation precision isn't all that tight and the width of the path around the building is pretty narrow. If the vision system returns fairly stable position information (despite vibration of the chassis), then the robot will more reliably be able to avoid the barrels, I think, without dependence on navigation precision.